A short postcard from Washington as we get under way with the congress. Today was the arrivals and greetings day - checking in, registration, an opening reception and a chance for old and new friends to exchange greetings. I have had the pleasure of staying with Rick Wyatt for the past couple of days, so I am gradually getting accustomed to the repeated shock of stepping from the cool 20 degree indoors environment to the perpetually hot 35 degrees outside, and considerably more when stepping out into the sun. The venue is magnificent, if somewhat disorienting. Who knew we would need a search party to find an exit to building! I am sure we will get to know the way around the Washington Masonic Monument in due course. The main events today were the registration and opening reception. Ted Kaye diligently staffed the registration desk, and in his usual manner had every detail organized. Times for the guided tours of the Smithsonian Institute, block bookings for dinner tonight (a crab restaurant - a local specialty), Lebanese tomorrow night. Everything was laid out and tabulated, and Gus Tracchia was his right hand man, passing out the materials. Their jobs were greatly inhibited by people renewing acquaintances, and pulling themselves away. An opening reception gave everyone a chance to mix and mingle, and we were duly welcomed by Kin Spain, Michel Lupant, and Graham Bartram who proceeded to distribute awards to past winners of prizes and to Fellows of the Federation (FIAV). The awards consisted of a certificate and a medal and cufflinks in FIAV colours. Most impressive. Of course, the main event was the opportunity to greet each other - I am sure I will miss some names, so go to http://www.washingtonflagcongress.org/attendees.htm to find the full list of attendees. Rick Wyatt, Pete Loeser and I headed out for dinner into a popular Italian restaurant - so popular that we encountered Ted and Debbie Kaye, Peter Orenski, Andreas Herzfeld, Philippe Rault, there, who all joined us for dinner, and other vexillologists already dining! A very pleasant evening ensued, as we caught up on each other's activities. Now it is time to get serious as the real work begins in the morning. 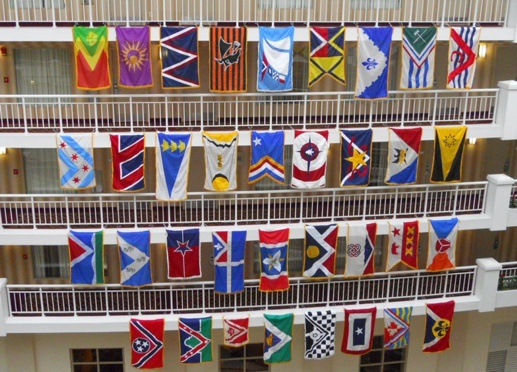 The display of NAVA flags in the Congress hotel. The ICV is off and running. This morning we woke to hot temperatures for the stroll (you don't "walk" around here when it's 28 degrees at 7 a.m.!) up to the George Washington Masonic Memorial - a most impressive edifice on the hill overlooking the Potomac River and with views to the Capitol and White House. Delegates arrived early not wanting to miss a thing, only to be greeted by blazing sunshine and rising temperatures. Those less acclimatized struggled to find shade behind walls, under shrubs, but just standing there was sweltering. Thankfully the organizers took pity on us and move the opening ceremony into the main entrance way to the memorial, so under the stare of an immense bronze statue of GW we duly paraded in the flags of the various organizations, cities, district, states and nations involved, heard the FIAV anthem and Michel Lupant declared the congress open with a pounding thump of the gavel. Accompanying members went off on bus tour of Washington, and the rest of us got down to business. In the blessedly cool surroundings of the lecture theatre, our first lecture was by Dale Grimes Jr who identified the star-spangled banner and the Iwo Jima flag as the two most important flags in US history. In a very clear and well-presented talk he showed his collection of US flags, many flown till they tattered, and his efforts to locate the lost pieces of the star-spangled banner, long since cut off and likely given away by the Amistad family as souvenirs. This presentation was followed by a fascinating account by two museum researchers, Alexandria Deutsch and Gwen Spicer, of a single flag in the Maryland Museum, the flag of the 4th regiment of US Colored Troops. This was a US Civil War regiment, and the flag was obtained from battle by one of the black soldiers. We learned of his life and the conditions he faced from Alexandria, and Gwen then spoke of the extent the museum has gone to preserve the flag. Interestingly in the questions after, she was asked why the white stripes wear out faster than the red ones - the bleaching and dyeing processes are harsher on white silk, but on cotton flags, it is the other way around, where the red wears out faster. The final morning session was by Geoff Parsons, from the UK flag institute who reviewed the royal banners of England and then the UK from before 1066 to last month (the Duke of Cambridge's Canadian standard). I tried to jot down notes on all of them, to check against our pages, but the kings were coming thick and fast, and I gave up after 300 years - this presentation reviewed 6 years of school history lessons in 25 minutes! I did not recognize any wildly different flag from the ones we show. The French fleurs de lys came and went, and the various unions of England and Scotland all looked very familiar. After a sandwich lunch we resumed with John Hartvigsen describing his researches which led to the recent change to the Utah state flag - changing the shield colour from blue to white and placing the 1847 date where the text says it should be. We saw images of early Utah flags, culminating in the 1911 flag. The original flag was embroidered, and one can imagine why the shield was left the same blue as the field - otherwise it would all have to have been filled in by stitching. Most of the early flags, including those presented to the USS Utah were hand embroidered - and some of these were not small flags. Two versions of the modern flag have been found - one with the traditional scowling herniated eagle, and one with a more imposing bird - the first of which from the production line John presented to the NAVA silent auction, going on outside the lecture hall. Arthur Etchells then took us on a whirlwind tour of infantry flags of Russia, looking at the foreign influences in them - elements from various European flags often thought to be unique to Russia are in fact "borrowed" from other countries - the two-headed eagle from Prussia, the lozenges from Sweden, the St. Andrews/St. George cross combination from the UK, teeth (multiple triangles) from Austria-Hungary. Overall I got the impression that the study of Russian vexillology is challenging - both on account of the diversity and number of flags, and the difficulty of access to museums where the Russians have kept everything. We had a short break in the proceedings, and Philippe Rault took the chance to recount his experiences as a child in "Old Virginie", rife with tales of the Civil War era, ending with a double shooting at 400 King St (probably close to where we dined last night!) over the capture of a flag, and a replica of the flag that caused it all. This was followed by a short message from Annie Platoff, second VP of NAVA, informing us that all the NAVA News and many Raven issues have been digitized for posting on the internet, up to 2009, and her intent to launch a Vexindex of vexillological articles. Although this index may probe deeper than ours, I think António has already nearly completed that for her with the FOTW bibliography - I'll make sure she knows that. Following a short break, Dave Martucci led us back in time to the earliest colonial period in Nieuw Amsterdam (now lower Manhattan) with a presentation on the standards of the Manhattoes, Pavonia and Hell-Gate (all now regions of NYC). This was obtained from writings of Washington Irving, who wrote under many pseudonyms in the early 1800s. His presentation was filled with fascinating references to objects long since lost from NYC flags - beavers (black ones, gold ones, rampant ones), oysters recumbent, devil's darning needles volant (probably dragonflies), more beavers, and the like. Finally Don Healy presented on the flags of the Indian Reservations in San Diego County, USA. Unfortunately his presentation was marred by the loss of the microphone, but Alain Raullet and Gus Tracchia who wore out their arms raising many of these flags for us to see and photograph. So concluded the presentations for the day, but the silent auction continued upstairs, and the bazaar got under way downstairs. Several flag dealers provided material for quick sale - Rick Wyatt unearthed an immense collection of US and Canadian municipal flag flag-wavers at a great price, and there was lots of interest in acquiring recognizable examples. As we prepared to depart and walk down the hill in the 37 degree (shade temperature - must have been 45 in the open) heat, we were welcomed by a short thundershower which helped to drop the temperature even if it couldn't wet the hot ground, and by Željko Heimer arriving for the congress (his flight yesterday was cancelled on him, and we missed him as our MC this morning). I hope now to have a short FOTW editing workshop this evening, so must sign off and get ready for that. Day 2 has drawn to a close in tropical Alexandria, Virginia. Fortunately our conference rooms are pleasantly cool, but the shock of stepping out into the heat still causes me to gasp. First off this morning were two Croatian presentations. Jelena Borosak Marijanovic described the late 19th-early 20th century Sokol movement in Austria-Hungary. This was a socio-political physical training movement in Slavic Europe, with nationalistic undertones. Sokol is, I think, an acronym, but it is also the word for a falcon, so the falcon symbol was obvious on their flags and finials. Being an international sporting movement, international meets were commonly used to display their flags, most of which were basic red-white-blue horizontal tricolours, although some had intricate decorative embroidery. Jelena was followed by Željko Heimer, who was delayed a day in Frankfurt en route to Washington, where he learned of his promotion from captain to major. Željko provided a masterful analysis of a very complex topic - the flags of political parties of Croatia. Since the country was established 20 years ago, some 218 parties have appeared, of which 109 are still extant. Of these, 33 hold seats in parliament and the others are splinter groups, minor special interest groups, many of them one-person operations. Parties are required to adopt symbols, and now with the completion of the 7th election since independence, the major parties have matured and many of these symbols have evolved into flags. Tricolours are widely used on both the left and right, often to denote nationalist affiliation. Bicolours are used mainly by agrarian parties (many are blue/green combinations). Monocolours are used by all parties, many reflecting similar use in other countries in Europe. The flags in Željko's collection (54 of them) appear to be quite effective for their purpose. The first session was concluded by Marcus Schmöger who detailed the political party flags of San Marino. Yes - there are many political party flags in San Marino. He reviewed the topic in a historical context from the late 19th century on, through the democratic period of the early 20th century, the fascist period up to WW2, although flags were very rare from that period. Now there are 11 parties in the parliament, and Marcus presented a "family tree" of the parties that resembles the vine entangled on a pergola outside the conference hotel! The flag business in San Marino must be outstripping the stamp issuing business. In the analysis, national components include white over blue, three hills with feathers atop, and St. Marinus; outside influences include socialist red, the hammer and sickle, the socialist rose, the carnation, and even the donkey, derived from the US Democrat donkey, through an intermediary Italian party of similar inclination. After a break, Scot Guenter (San Jose State University) described the rise and fall of the Worldface website - a social networking Facebook take-off that substituted nations for individuals. Some of the interchanges were hilarious, as nations friended each other. The site took off for about 6 months, but was invaded by Hetalia, an anime social networking site, was reduced to squabbling, and soon shut down. Scot's presentation was followed by two short presentations, the first by Lee Herold on searching for the essence of flags. In a very introspective presentation, he wondered why we treat flags the way we do - do we approach a flag belonging to Solzhenitsyn the same way as we approach the same flag owned by Stalin? He opined that the colours and symbols on flags co-evolved with the brain, and just as mathematics or music has an inherent structure, so do flag designs. Last talk before lunch was by Peter Hans van den Muijzenberg, entitled "On a Scale from 1 to 10". He set out to prove that the black/yellow bicolour of Sneek is the best flag in the world. Starting with the Good Flag/Bad Flag rating scale, expanded by Mason Kaye on the K scale, Peter Hans has developed a rating to try to approach a better way of devising a rating scale. I hope he will explain it better than I can - I think he based it on the results of the American City Flags survey. In the end he decided that the Sneek has a pretty good flag, but not necessarily the best. After lunch, Ales Brozek took us back to the days of the end of WW1 asking if the US influenced the Czechoslovak national flag. About a million Czechs and Slovaks lived in the US by the end of WW1, and during the war a proposal for an independent Czechoslovak republic was developed. As early as 1914 a flag was proposed in Chicago, with horizontal stripes and four stars (representing Bohemia, Moravia, Silesia and Slovakia). By the end of the war, US newspapers were reporting a five striped red-white-blue-white red flag with four white stars either in a centred lozenge arrangement of a line like Chicago's flag - the "Preissig flag". Photos exist of this flag in use in the cloth at Stamford, CT, and in the NY Times in June 1918. A period ensued when the Pressig flag and a white/red horizontal bicolour vied for pre-eminence, with the bicolour eventually winning. An interesting variant with the bicolour in an ogival shape, with a blue frame filling it out to rectangular, and an embroidered golden CS monogram gained some attention, but eventually this was replaced with the familiar flag of the modern Czech republic. In a break following this presentation, John Hartvigsen (see yesterday's report) was honoured for his efforts to correct the Utah flag. The final two presentations featured the modern and the ancient. Annie Platoff reviewed her attempts to outwit the conspiracy theorists who believe that NASA never did send men to the moon, and merely staged the lunar landings in Nevada. At one time Annie worked for NASA and in 1992 wrote a paper about the flags on the moon, which she finds amusing, is widely quoted by the conspiracists and the anti-conspiracists alike. Much of the conspiracy theory is promulgated by Bill Kaysing, oft-times seen on Fox News, and apparently is believed by 6-8% of Americans and up to 20% of Russians (I doubt they get to see Fox News). The conspiracy is based on the absence of a blast effect beneath the LEM, no dust on its pads, peculiar shadow and lighting effects, and of course the way the flag hangs or moved as if in air. Annie succinctly demonstrated the fallacies in these arguments, concluding with a rather eerie frame animation where an astronaut moves around but the flag hangs wrinkled, as if caught by the camera, but unmoving from frame to frame. In questions afterwards, Annie answered one I know we have debated in the past - what is the condition of the flags now? She pointed out the flags were regular issue flags, not designed to stand up to the photodegradation ("sun rot") and solar radiation, and bombardment by micrometeorites, and they are likely faded to brown and tattered or decayed to dust. The final paper by Suzanne Thomassen Kraus, the textile conservator at the Smithsonian, related the story of the preservation of the star-spangled banner, outlining the history of the Battle of Baltimore, its survival at Fort MacHenry, and its subsequent movements. Interestingly the flag was viewed in the open until as recently as the 1980s. We get to see it tomorrow. The afternoon concluded with the 22nd General Assembly of FIAV. Some of the highlights of the meeting included a report on the redevelopment of the FIAV website, the re-election of the president and secretaries, the admission of the State Council of Heraldry of Georgia, the Stichting Vlaggenparade Rotterdam, and the Macedonian Heraldry Society into FIAV. We also received a report on the plans for the next congress in Rotterdam, NL, the early plans for the congress in Sydney, AU, in 2015 ($35000 sponsorship already obtained! ), and a proposal to hold the 2017 congress in Portsmouth, England. Plan your leaves and travels accordingly. Note that while congresses are usually in late July, early August, the Sydney one will likely be in the first week of September, as that will coincide with the start of spring, and the Australia Flag Day, in the year of the 100th anniversary of Gallipoli and the establishment of ANZAC. And so ended the day - back out into the heat of the afternoon and a chance to mix and mingle around the bar. Good times! Day 3 at the ICV was a day to get out and see Washington. We were joined by the flag makers association who are meeting separately, so 200 of us crossed the Potomac to spend the day at the Smithsonian Institution, the world's largest museum. The main stop was at the Museum of American History, where the pride of the exhibit is clearly the star spangled banner. I seem to have been chasing this banner everywhere I have travelled in the Philadelphia-Baltimore-DC area, and finally there it was. Unloading from the bus, and into the museum, the SSB is right at the main entrance, so of course we all immediately headed into the line to view it, thereby extending the line practically out the door. Check out http://americanhistory.si.edu/starspangledbanner/ if you want to see all the details, and I can assure _all_ the details are laid out to see. The flag itself is surprisingly large - as big as a room - and beautifully laid out in a low light setting to view. Then there is an electronic image of the entire flag at 1:1 scale, where you can touch the screen to learn more about the making of it, the damage to it, the missing bits, etc. Outside the exhibit, poor Mary Pickersgill is there to tell you all about the hard work she had making the flag - I say "poor" because 90% or more of the people meeting her called her Betsy Ross! She very graciously corrected them all. However the museum is not all about the flag - it has some beautiful displays of the gowns worn by the first ladies at their husbands' inauguration balls, an extensive gallery devoted to the US presidency, Julia Child's kitchen (a famous US TV personality who pioneered cooking shows), and many other aspects of life in USA. Having interests outside of flags, I chose to nip next door to the Museum of Nature to review the rock and mineral collections - the meteorite collection is phenomenal, as is the mineral collection, but at 1 p.m. I had signed up for a "behind the scenes" tour of the AMH. We were escorted to the basement where we got to see the Butler flag, recently unwrapped after being transferred from another department. A 32-star flag, found in New Orleans, the Butler flag is nearly reduced to dust in some areas, and great efforts are being made to preserve it. We also saw flags that had been received that were used in Berlin when the American forces reached it in 1945. Following that we were taken up to the flag storage area, which is currently in the process of being re-housed. Old boxes are being replaced by new drawer cabinets, and in the process, items are being systematically recorded. Many of these flags are not so fragile, and we were able to pull out a few drawers and see the treasures. Jose Alegria was excited to discover some rank flags of the 19th century Spanish navy, and Željko Heimer found a flag he recognized from Austria-Hungary (both flags previously unidentified). I think the staff were somewhat distressed that our visit was so short, as much could have been done to distinguish these flags. Lots of photos were taken, and I hope some of the FOTWers present will open a gallery on the Y-groups site to show some of the views. This evening, we have been entertained by the NAVA Vexibits show - short snapper presentations, reveals of interesting flag or flaggy objects, in an open floor setting. A very interesting way to show off our flags. Thursday began with a NAVA board meeting in place of the first session. NAVA has been especially active this year, planning for the ICV, preparing publication of a special issue on Canadian Civic Flags, and undertaking the VexIndex project I describe a few days ago. Talks began after the first break, with Alain Raullet describing his escapades in promoting vexillology. Alain has a weekly radio slot in France on flags, and outlined his recommendations to get vexillology into the public eye: organize a flag exhibition; run a flag quiz; organize a conference; run a flag design contest for children; sponsor a new flag. Using provocative images, he showed the result of his efforts. Tony Burton then gave a very thoughtful analysis on "Raising the Standard", arguing that good design is essential for effective flag meaning. His guidelines included (1) consider the stakeholders - they own the flag; (2) if there is a symbol already in use, use it; and (3) is there anything else? He emphasized that "less is more" - keep the designs simple. He then proceeded to examine the congress flag, with visible symbolism derived from eight different flags. Further analyses ensued of the Sydney 2015 congress flag, and then proposals for Mozambique, Cyprus, Dominica and St. Vincent. The morning sessions ended with Sebastia Herreros Agui, who showed a large collection of images of Catalan Modernism and Vexillology - starting with Antoni Gaudi, and continuing through several early to mid-20th century designers, finding Catalan flag symbolism in architecture. After lunch we were treated to an exhibition of the Ben Zaricor Collection, including the flags of US presidents used at their inaugurations, or in the case of JFK, assassination. He also showed guidons used by Custer's regiment (after his death), the only 17 stripe flag known, and the British Union Flag saved from the Battle of Trafalgar, recently sold Sotheby's in London. The afternoon began with Ralph Bartlett displaying Unity in Flags – flags often represent the unity of peoples, countries, alliances, and organizations. As example, he looked at the heraldic banners of Castile & Leon, the UK royal banner, and Austria-Hungary. Similarly flags of the UK, the German Imperial flag, and the Canadian confederation are symbols of unity. Even flag families (Central American blue-white-blues, Gran Colombia flags, Slavic, pan-Arab, and pan-African flags all show unity of peoples. In Ralph's opinion, the flag of the Olympic movement is one of the best examples of such a flag. Patrice de la Condamine reviewed the flags of constructed language – starting with Volapuk, and proceeding through Esperanto, Bolak, Ido, Interlingua, and Occidental. He also looked at cultural language flags - the Germanic Folkspraat, Slavio, etc., and closed with an examination of Conlang, the language creation society. Constructed languages commonly use white, blue and red, to represent hope, infinity, or radiant light. Flags can be more than territorial, also representing nations of the spirit. Marcel von Westerhoven, who is heavily involved in running the Rotterdam congress, examined the translation of coats of arms into flags. In the Netherlands, local flags may exist only in the town hall, but in well designed flags often get widely used in the municipality. Many are derived from coats of arms, and the best use simplification, and rotation from a vertical to horizontal charges. Complex coats of arms don't make for good flags, even when placed on distinctive backgrounds. Michel Lupant, president of FIAV, showed his discoveries from travels in Micronesia. He had access to the parliament and was able to get close-up shots of the flags in the famous photograph of the chamber. He unearthed many details of local flags, which we look forward to seeing in the proceedings of the conference. Roman Klimes then gave an exceptionally detailed presentation on the flags of Gibraltar, from the coat of arms in 1502 up to the modern day. Interesting oddities included a 4 x 8 m flag made of Lego (393,857 bricks! ), and the discovery of the arms of Gibraltar used on the flag of the nearby town of San Roque, Spain, but using the Spanish royal crown. My own talk followed, where I analyzed the maritime symbolism on municipal flags of Atlantic Canada - lobsters, seals (the flippered variety), ships of all sorts from dories to oil rigs, fish (mostly cod, some salmon), waves and lighthouses. Three of the provinces are dominated by such symbols, but in New Brunswick, the use of the Acadian star appears to have displaced the use of maritime symbols. Finally Bruce Berry described the stillborn symbols of KwaNdebele, a self-governing homeland during apartheid. His research has turned up symbols for the president, various officials and ambassadors that imply the homeland was committed to achieving independence. So ended a fine day of vexillological presentations, and we adjourned to the hotel where about 35 people convened to discuss FOTW. About half of the attendees are not regular FOTWers, and many expressed an eagerness to be more involved. There was consensus that backlogs should not be permitted to grow to great lengths, that we should participate in the NAVA VexiIndex project, that we really do need to update the page-building program (RIP fotw.exe), that we do want to retain FOTW as a site distinct from Wikipedia; that wiki-type editing may sound good, but the inertia of the size of FOTW makes it prohibitive at this time; that editors should be encouraged to put a face to their names on the editor pages; and that at least three new volunteers stepped up to edit, and one to add to our graphics capabilities. All in all, a very fast paced 90 minutes, lots of good ideas, lots of background laid out; and hopefully, lots of collaboration in the future. The ICV has come to an end. Another fine day of presentations today culminated in the closing banquet. The first talk of the morning was by Kenneth Hartvigsen on Flag Violence in Civil War sheet music. Ken is an art historian and discovered a piece of 19th century sheet music for "Down with the Traitor's Servant Flag" by Flint and Higgins, wherein a Union soldier stood on a Southern flag, with an erect Stars and Stripes flag. Such illustrations were prevalent in magazines like Harpers Weekly during the period. Ken was able to extract enormous symbolism from the artists' work. This was followed by Avelino Couceiro Rodrigues who described the origin of the Cuban flag, with early prototypes made in New York and New Orleans. Francisco Gregoric, of FOTW fame, then gave an overview of the flag of Buenos Aires, dating back to the arms of the founders of Buenos Aires in 1580. The black eagle with her eaglets and cross has survived from the earliest days, although lost for a period, when a design with two ships and a dove were used. Most early examples were found on arms, but the flag was use as a de facto flag showing the arms on a white field around the 400th anniversary of the city in 1980. Attempts were made to revise the flag for the bicentennial of Argentina in 2010, but did not succeed. After a break, Peter Ansoff reviewed the connection between the US Grand Union flag and the British East India Company flag - are they coincidentally similar, or is there a connection? While they are effectively identical, the EIC flag is older - did Americans know of it? His conclusion is likely not, as the EIC flag could only be used east of St. Helena. Furthermore, the EIC was seen as competitor, almost an enemy of the colonies, so it is unlikely they would have adopted that design. Chris Maddish then provided a highly animated presentation on a handkerchief once owned by Martha Washington held in a private collection - it is a printed cloth with George Washington riding on a horse, and has four flags around the perimeter - one a rattlesnake flag, one a 13 red stripes flag, one a pine tree (Appeal to Heaven) flag, and the fourth a colonial white ensign, but with a 13 red-rayed canton instead of the union flag. It was likely printed in Philadelphia by John Hewson, a descendant of John Hewson who signed the warrant for execution of Charles I. This previously unrecognized flag Chris proposed be called the Martha Washington flag. At lunch, NAVA held an auction of flags selling of several of the items visible around the conference site, and after lunch, Tadej Jakopic from Heraldica Slovenica reviewed the history of the Slovene flag in this, the 20th year of independence. He reviewed heraldry going back to the Dark Ages, up to 1848 when the flag was first used, concluding with a stirring video of the raising of the flag and playing of the national anthem. Jos Poels then discussed the Orange Pennant - a long pennant flown above the Dutch flag on the birthdays of members of the royal family - and the links between the orange and red on the Dutch flag. The earliest flag used orange, but that morphed into red by 1630, and by the late 17th century, only red-white-blue flags are seen in paintings. In the mid-18th century orange pennants appeared with Dutch East Indian Company flags, although red-white-blue pennants are also seen, so the orange is thought to indicate a royal connection. The royal (Orange) family were exiled until after the French era (into the 1800s), when the orange pennant again became used, and increasingly used through the mid-20th century. Orange today is very popular, as witnessed by the national football strip. Ralph Kelly then reviewed the "Southern Cross Down Under" - remember "Southern Cross" refers to both the flag of the Confederate States, as well as the constellation in the Southern Hemisphere. Is there a connection? In 1865, the CSS Shenandoah arrived in Melbourne wearing CSA colours - the white ensign with starry cross in the canton. Considerable support was expressed for the Southern sailors, although officially Victoria was neutral in the war. After repair, the ship set sail into the North Pacific with many Victorian "stowaways", and proceeded to capture many US whaling ships. Unknowingly, the capture of the whalers happened after the end of the Civil War. Ralph speculated that the visit of the Shenandoah led to the recognition that Victoria required naval protection, thereby requiring the adoption of naval flags, initially the blue ensign with the Southern Cross - was there a link to the Southern Cross on the CSA flag? This flag, of course, evolved eventually into the Australian national flag. The final presentation was by Jan Oskar Engene, who described four forgotten Norwegian ensigns, discovered on the flag charts Marcus posted for us 2-3 years ago. These were for port authorities, harbour police and fisheries inspectors, some of which although eliminated by the 1898 Flag Act were still in use as late as the 1930s. This concluded the technical presentations. I must observe that they were uniformly of high quality - every one was intelligible, and the authors had gone to considerable lengths to explain the subjects. Following the presentations, Marcel van Westerhoven described the plans for the ICV 25 in Rotterdam. The website is at http://www.nfc2013.com/pages, the dates are 5-9 August, 2013. The flag of the conference is in the style of the Dutch naval jack, with red and blue lozenges at the hoist for Netherlands, and two green lozenges to the fly for the Rotterdam green-white-green flag. Other layers of meaning show windmills. Organized by three groups (NVvV, Rotterdam Flag Museum and the Parade of Flags) it promises not to disappoint when it comes to volumes of flags! The venue will be in the Beurs World Trade Centre, and the congress will open with the raising of flags on the Flag Parade and a reception at the old City Hall. On the Wednesday, the excursion will visit The Hague, including the Peace Palace, the Hague Flag Parade, Leiden Museum of Ethnology with its extensive collection of Dutch East Indies princely state flags, and an evening sail and dinner on the Spido. On the Thursday evening will be an opportunity for a visit to the Maritime Museum with an exhibit on hand-painted flags, and on Friday closing dinner at the Laurenskerk (Lawrence Church). On the day after the congress is an optional tour to the Amsterdam Maritime Museum. During the conference companion tours will take in Delft, Gouda and Kinderdijk (to see windmills). Plan your attendance accordingly. honorary membership in NAVA awarded to Scot Guenther. the Vexillon, provided by Flag Society Australia, to Annie Platoff for her work on the Russian flags Raven issue. Finally, Whitney Smith and Scot Guenther were recognized as Laureates of the Federation. After all that, we were very happy to get on with the delicious dinner, and a chance to chat and mingle. Before we said our Farewells, we took the chance to get a group photo of all the FOTWers we could round up on short notice. Tomorrow, some of the group are going on to Annapolis to the naval yards, but I will be heading back to Nova Scotia. I hear there is editing to do. 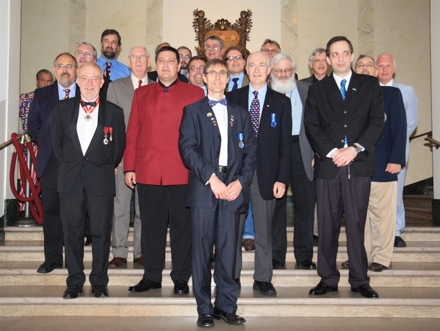 In the photo, from left to right: Emil Dreyer, Michel Lupant (in front), Graham Bartram (behind Michel), Peter Hans van den Muijzenberg (blue shirt), Peter Edwards, Željko Heimer (red jacket), Jan Mertens (in back with beard), Jose Alegria (part hidden), Rick Wyatt (back), Bruce Berry (front), Marcus Schmoeger, Rob Raeside, Petr Exner (back row), Dave Martucci (white beard), Lee Herold, Francisco Gregoric, Jim Ferrigan and Per Magnus Banck.